Weiss-Aug, a leader in metal stamping, insert injection molding and assembly for the medical device industry now offers in-die laser welding. This unique combination of metal stamping and laser welding inside the stamping press eliminates the need for post stamping welding and assembly operations. Inside the progressive die, after the cutting and forming stations, specialized stations are utilized to position the area of the component to be lasered. The laser heads are aligned with these stations and the lasers emit a short burst which completes the weld when the press is closed. As the press opens, the components are 100% inspected by camera vision systems for any visual defect or tolerance defect. The component is then reeled up for additional operations or singulated per customer specification. Weiss-Aug is one of the first companies in the US to offer this service to its customers. Typically laser welding operations are a separate assembly operation from other manufacturing operations. This leads to additional time and resources to deliver a finished component. 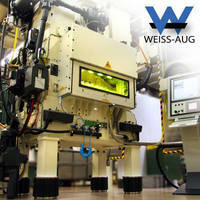 Weiss-Aug's New Program Development Group, a specialized engineering team focused on research and development of new products, developed this process for its customers to deliver a more cost effective and efficient manufacturing process. Steve Czapla, manager of the group has used progressive metal stamping, a cost effective process to replace other metal manufacturing technologies for customers for many years. By adding the laser welding process to metal stamping, the group utilized an existing technology in a new way to deliver robust components at a lower cost point. Complex tooling, very tight tolerances and high speed of press operations are all very important considerations in the development of in-die laser welding which require extensive experience and tooling knowledge. Weiss-Aug has been providing precision metal stamping and complete in house fabrication of metal stamping dies to medical device companies for over 30 years. Weiss-Aug is your partner for innovative and technically sophisticated custom insert injection molding, precision metal stamping and integrated component assembly. Weiss-Aug is ISO 13485 certified.